The relevance of the selected research topic is determined by the following circumstances. According to the Stockholm International Peace Research Institute (SIPRI) there is now an increase in the number of regional conflicts. The study of Sweden’s neutrality as a form of conflict resolution by means of dialogue, and the search for mutually advantageous solutions are gaining importance again. 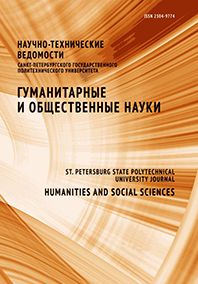 The methodological basis of this article is the principle of scientific objectivity in working with the published Russian and foreign sources. It is revealed, firstly, that Sweden was oriented toward the Western countries and the United States. Secondly, Sweden didn’t want to participate in military operations on either side, including the NATO alliance. Thirdly, Sweden avoided diplomatic complications with the Soviet Union. We should note that the Swedes themselves didn’t ever idealize their own foreign policy. They call it “de facto permanent neutrality”. The conclusion is that the neutrality was always a means to an end rather than an ideology for Sweden. It was used exclusively in cases of military threat, and, as most of the Swedish politicians believed, this was quite enough. A major role in understanding the policy of neutrality was played by the Swedish Prime Minister Olof Palme. It should be noted that Swedish citizens could not participate in a real discussion of the state’s policy of neutrality or influence its formation. The material of the article can be used to study the history of Swedish relations with the Western countries, the USA and the USSR in 1940–1970.